A stunning view of Faralya in Turkey. Outdoor enthusiasts will love Faralya in Turkey; camp outside with crystal clear water just a stone’s throw away. Lepidopterists will be happy to know that Butterfly Valley is home to numerous species of butterflies – number 56 on our 100 Secret Gems You Need To Know About list. 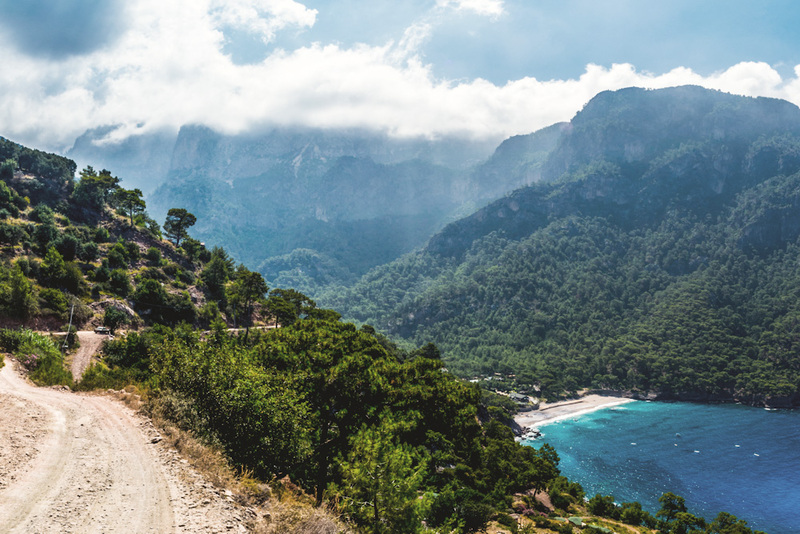 This tiny hamlet is part of the village of Uzunyurt on Turkey’s south Tekke Peninsula (Lycian Way). Below the cliff-side hamlet of Faralya, via a rather treacherous steep path, is Butterfly Valley, home to around 100 species of butterfly. This heavenly canyon has a beautiful white-sand beach, turquoise water, and waterfall surrounded by mountains. Spend a night or two here at a campsite or just pitch up on the beach.